This description is from Nancy, the museum’s director of the Cockrell Butterfly Center and curator of entomology. She’s chosen a selection of objects that represent the rarest and most interesting insects in the Museum’s collections, that we’ll be sharing here – and on hmns.org – throughout the year. The name says it all: the Titans were a race of giants in Greek mythology, while giganteus is Latin for giant. This monster from the rainforests of the Amazon basin in South America is the largest beetle in the world, at least in terms of overall size (the African Goliath beetle, a scarab, is heavier). The giant longhorn is a member of the Cerambycidae or long-horned beetle family, which includes over 20,000 species worldwide. The family’s common name describes the very long antennae characteristic of most cerambycids – in some species over twice as long as the body. Male cerambycids typically have longer antennae than females of the same species. 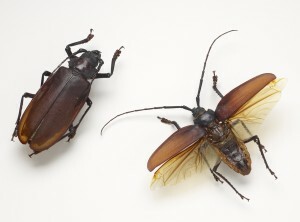 Shown here are a male (wings spread, longer antennae relative to body size) and female (larger, with somewhat shorter antennae). Learn more about beetles and their relatives in a visit to the Brown Hall of Entomology, a part of the Cockrell Butterfly Center – a living, walk-through rainforest at the Houston Museum of Natural Science. You can see more images of this fascinating artifact – as well as the others we’ve posted so far this year – in the photo gallery on hmns.org. I have just caught one in my backyard in Reno Nv. I believe anyway. It looks just like the one in the picture but mine has more jagged antennae and almost 2 inches long. I kinda want to keep it. Should I? How cool that you found a longhorn beetle in your backyard in Reno (my cousin lives there, nice place!). I’d love to see a photo if you want to send me one (ngreig@hmns.org) – maybe I can identify it for you. There is nothing wrong with keeping it if that’s what you want to do. Is it dead? If it is alive and you want to keep it alive, try giving it a piece of apple or banana. If it is already dead, you may want to pin it or put it in a Riker mount for display. You can get insect pins and/or a Riker mount from BioQuip (I think it’s http://www.bioquip.com)- or you could make your own display box. Feel free to send any more questions. We found a longhorn beetle similar to this in Ogden, Utah. 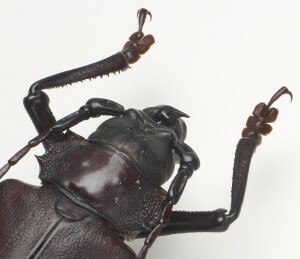 See http://hubandfamily.com/beetle-utah.jpg for a photo of the beetle. We let the beetle loose but are curious as to what kind it is. This is a cool looking beetle! While certainly not as large at the giant longhorn beetle from South America, these are among the largest beetles in the United States. It is probably Prionus californicus, or the California root borer, which is very common to that part of the country. The larvae feed on roots of trees, hence the name root borer. They are, for the most part, completely harmless, but they can pinch with their large mandibles if they feel threatened! Hi don’t have a web site but I’d like to e-mail you a picture of a huge beetle found outside our back door last night near Olympia WA. It was about 2.5 inches long and the jagged antenna were about 2 inch long. Let me know an e-mail I can send an attachment to. We just wanted to know if you could identify it for us. I just found one of these this morning in our garage. It was just lying there dying. I can’t believe how big it is, I looked for a long time before I saw a picture of it on line. How rare is this beatle? Should I be giving it to someone? Are they good beatles?? Wow, it is amazing.